She is most certainly beautiful, fashionable and charming, but the 21-year-old crowned Miss JSU is, above all else, passionate about helping students and promoting the university. “I essentially pursued the crown of Miss JSU because I love my university,” says Gabrielle Baker. That love is evident in the Memphis native’s many activities. A mass communications major with a minor in political science, Baker has been active in the Student Government Association, Pre-Alumni Association, Dance Ensemble, MADDRAMA Performance Troupe and Essence of a Lady Tiger. She’s also in the W.E B. Du Bois-Harvey Honors College and was a spring initiate of the Delta Pi Chapter of Delta Sigma Theta Sorority. Her platform,“Thee Real Experience: Providing Real Service, Exemplifying Real Virtue, and Promoting Real Unity,” emphasizes mental, physical and spiritual development. Baker ‘s crowning achievement also exemplifies the importance of perseverance. Undaunted, she stayed the course. Baker, whose ambition is to someday work as an entertainment publicist, now wants to leave her own mark for aspiring queens and the next generation of Jacksonians. That love is evident in the Memphis native’s many activities. A mass communications major with a minor in political science, Baker has been active in the Student Government Association, Pre-Alumni Association, Dance Ensemble, MADDRAMA Performance Troupe and Essence of a Lady Tiger. She’s also in the W.E B. Du Bois-Harvey Honors College and was a spring initiate of the Delta Pi Chapter of Delta Sigma Theta Sorority. Her platform,“Thee Real Experience: Providing Real Service, Exemplifying Real Virtue, and Promoting Real Unity,” emphasizes mental, physical and spiritual development. LaCurtis Powell, student government association president, brings an extensive leadership resume to his role. The ROTC cadet, on track to become a second lieutenant this spring, began his path to the presidency when elected Mr. Freshman. During his tenure, he was responsible for leading community service projects for the class. He also created an organization called the Democrats and registered more than 200 Jackson State University students to vote. “This initiative allotted me the opportunity to raise student awareness for voter registration because Jackson State has its own precinct,” the senior criminal justice major said. During his sophomore year, the Jackson native was appointed director of public relations for the cabinet of Kendall Bunch, SGA president 2016-2017. Powell, an Alpha Phi Alpha Fraternity member, continued his leadership journey as president of the junior class. Duties included hosting campus events and class meetings and leading community service projects. Mirroring his tenure as Mr. Freshman, Powell decided again to expand his role by hosting ACT workshops for high school students in the Jackson Public School District. Once his term ended, Powell didn’t plan on pursuing another student government association role. “I had plans of being a regular student, but the campus population needed me,” he said. With a wealth of knowledge regarding the position, he decided to campaign for the 2018-2019 SGA presidency. His platform, “Give P.O.W.E.L.L. to the people” – “Promoting Opportunities, Work, Experience, and Lasting Leadership” – continues to shape his advocacy for students. It was, in fact, those same qualities that brought another leadership role to Powell this year, this time on a national level. He was chosen to serve as the director of legal affairs for the National Consortium of Historically Black Colleges and Universities of Student Government Association Presidents. “It made me feel great that I can represent JSU to the best of my ability,” he said. 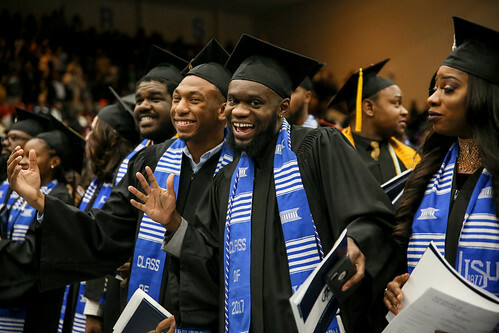 As president of the SGA, the 21-year-old strives to “increase student morale and keep students well-informed as to what is happening on and off campus.” Powell, too, reinforces the importance of students supporting JSU after graduation. Finally, Powell hopes his efforts will serve as example to others, including future SGA presidents.